I have a penchant for curling things… curling vines, wavy hair, the curve of a country road. I prefer a curving line to a straight one, a circle to a square, a light wave to a light particle. I like conversations that curve in unpredictable directions, and the curved trajectory of airplanes lifting into the sky. Which way are we curving? Rob Des Cotes reflected on this question in one of his meditations which Ruth shared with me in conversation during our summer camp. It is a Latin phrase: Curvatus in se. It sounds a bit like spell from Harry Potter, doesn’t it? 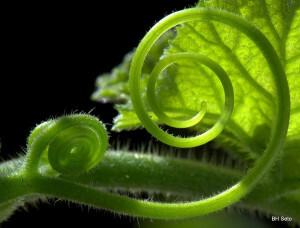 Curvatus – to curve. In se – in upon self. Curvatus in se, or, to curve in upon one’s self, is how Augustine defined sin. Rob elaborated on this phrase in his book Strength to Strength. “Sin”, he writes, “is understood as a process of increasing self-absorption which ultimately leads us away from the warmth of life. And the entrapment of sin is that it keeps us perpetually preoccupied with ourselves as we desperately try to fix, or save, our own lives.” In the reading he invites us to meditate on our own spiritual direction – which way we are curving – and he invites us to sense God’s direction, calling us away from the dangerous isolation of self-absorption and more towards the warmth of his love, and of our love for others. Please hear me: Rob was not saying that it is a sin to care for your own needs, or set healthy boundaries, or invest in your own wellbeing and pleasure. If you knew Rob at all, you knew how much he loved jazz music, a good beer, watercolours, walking trips, watching his sons play soccer. He made time to enjoy life. He also set boundaries with others, giving himself time to cultivate a deep interior life of prayer, and to swim almost daily. Taking care of ourselves and cultivating our own well-being is part of stewarding our lives, part of our worship of God. It is why the Sabbath is one of the 10 commandments. God wants us to experience joy and rest and live sustainably. However, what Rob modeled for us, in both his words and actions, is the vitality of a life curving upwards towards loving God, and outwards towards loving others, while maintaining healthy regard for self. Curving upwards and outwards is part of the good life, the way of freedom and rest, for which we were made. I recently heard about a couple who had marital problems. The man was a high-powered businessman driven by the world of profit and was rather disengaged from the marriage. The wife had little to occupy her, so she spent her life going to the gym and making herself beautiful, and waiting for her husband’s attention. The therapist redirected both of them in new directions. The woman was assigned an outward curve – something in the community she could do apart from her marriage and apart from her self. This woman chose to go weekly to pick lice of out of kids’ hair – a curve towards her own healing. Lately, I have been craving that outward curve. Lately, I have felt constrained, itchy for a deepening kind of engagement in the world. Which direction are you craving as of late? Into which kind of curving is God inviting you? What small action could you take today to begin curving in a new direction? There are almost twenty people planning to attend – we have room for a handful more. Would you like to come, too? It’s service-oriented in the morning followed by relaxing and connecting in the afternoon & evening.